Sepsis is an important cause of mortality, causing an estimated 60,000 deaths yearly. 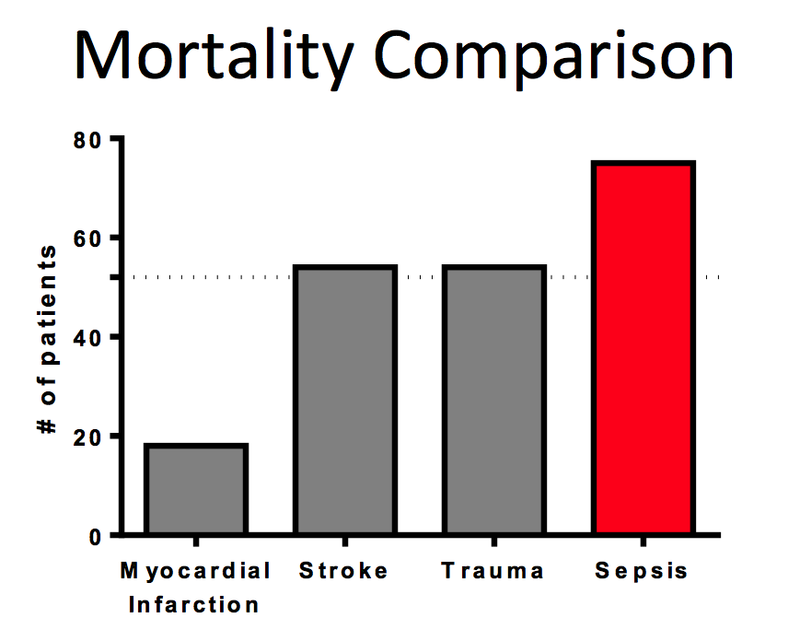 Sepsis is also expensive to treat, and is associated with expensive medical procedures, such as life support and intensive care. Despite advances in supportive care over the last 30 years, the mortality rates have remained stubbornly high, as much as 30-40%. In septic shock, treatment includes early and appropriate empiric antibiotics, source control, and supportive care. Of these, antibiotics and source control are thought to be the most important, but surprisingly little data support the elements of care. Controversy surrounds most aspects: fluids, pressors, oxygen replacement, and enhancement of cardiac output, to name a few. Kox et al wrote an illuminating recent review on aggressive therapy in sepsis and critical illness entitled Less is more in critically ill patients. In light of these ongoing controversies, can an evolutionary perspective of disease provide any guidance? Read Anderson’s account of controversy in giving fluid therapy for sepsis and critical illness. Persistently high sepsis mortality prompted many researchers and funding organizations to seek anti-inflammatory treatment to decrease the apparently harmful immune effects of sepsis, which has been described as an out of control inflammatory response. One thing that biomedical researchers noticed was that septic patients who die often had low levels of activated protein C. A recombinant form of activated protein C, called Xigris, has anti-inflammatory and anticoagulant properties. Since inflammation was thought to be out of control in the systemic inflammatory immune response, it stood to reason that an inhibitor of inflammation and clotting might reduce deaths in sepsis. In 2001 the PROWESS study appeared to show just that. Epitaph for Xigris – I never worked a day in my life! What lesson from Xigris’s failure can we learn about the functioning of the immune system, about sepsis, and evolution? Notably, Xigris is not the only high-profile failure for sepsis immunomodulatory therapy. A more recent anti-inflammatory therapy, a toll-like receptor TLR-4 blocker known as Eritoran, also failed spectacularly in clinical trials. Not be deterred, a new therapy for sepsis targeting the pro-inflammatory cytokine TNF-alpha, based on a compound called CytoFab, was recently tested. How do you suppose that one went? Shockingly, it too failed. These examples suggest that continuing to search for elusive so-called “magic bullets” in sepsis is a losing strategy. As cited in a recent article about the failure of anti-TNF-α in sepsis: “Success is the ability to go from one failure to another with no loss of enthusiasm,” a quotation attributed to Sir Winston Churchill. On the other hand, repeating same thing while expecting different results is also…well you know the cliché. You have a relative living in Amsterdam who was approached by a Dutch researcher about enrolling in a real study of an anti-inflammatory agent in endotoxemia: The study, entitled in vivo effects of C1-esterase inhibitor on the innate immune response during human endotoxemia is underway. What do you advise her to do and why? The blog Life in the Fast Lane has published a nice summary of what is currently known about statins in sepsis that is absolutely worth a read. Germane to our discussion, NEJM published a recent test of statins in the sepsis-associated lung disease. Result: Failed. Last year, a randomized trial of atorvostatin in sepsis failed to show an improvement in 90 day mortality. The authors of that study hold out hope that statins will be proven efficacious in sepsis, and the final word on this topic has not been published. Another randomized trial of statins in sepsis is currently recruiting patients, what do you predict will be the results?